Introduction: Hemangiopericytomas (HPCs) are rare neoplasms which account for approximately 1% of primary vascular tumors. Case Presentation: We report a 73 years old woman with vague abdominal pain who did not have further significant symptoms and was diagnosed to have retroperitoneal hemangiopericytoma. Discussion: The tumor was initially diagnosed by ultrasound evaluation. MRI showed a lobulated mass at lower lateral quadrant of the abdomen, adjacent to left psoas muscle with small cystic components. Successful surgical resection of the tumor indicated a solitary large encapsulated 10 × 7 × 4 centimeter retroperitoneal multiloculated mass. Subsequent pathologic studies confirmed the tumor to be malignant hemangiopericytoma. The patient is currently well and is evaluated by periodic CT scans. Hemangiopericytomas (HPCs) are very rare neoplasms which account for approximately 1% of primary vascular tumors (1). It is believed that HPCs originate from the pericytes of Zimmerman which surround capillaries and post-capillary veins with their long processes (1). The exact function of these cells is not well understood; however, it is suggested that they play an important role in modulating the diameter of the lumen of blood vessels via their contractile properties (2). Since pericytes are distributed in diverse areas of the body, HPCs are reported in different parts of the body; however they are more frequently observed in the soft tissue of the extremities, particularly the thigh (34.9% of cases) (2, 3). The second frequent site of HPC is pelvic cavity and retroperitoneal space where approximately one fourth of cases are found (4, 5). 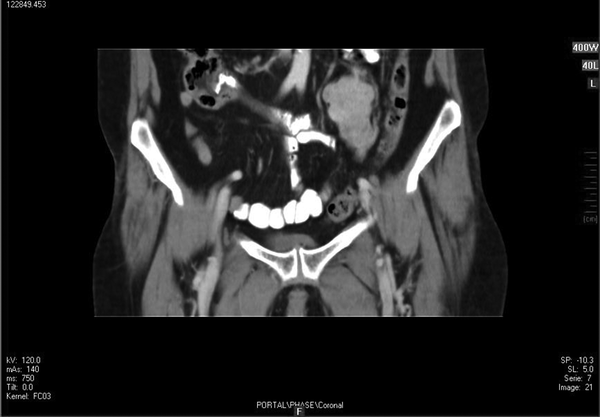 Paranasal sinuses, meninges, and omentum are other common sites of HPCs (5). In this paper, we report a 73 years old woman with retroperitoneal hemangiopericytoma and briefly review the literature. A 73 years old Iranian woman with a Caucasian race and gravida six para four was presented to our clinic with chief complaint of vague abdominal pain for about four months prior to admission. The patient did not have other symptoms including nausea, vomiting, bowel habit changes, fever, or weight loss. Past gynecologic history revealed that she had entered menopause at 50 years of age. In clinical examination, a large palpable mass was identified in left hypogastric area. The mass was non-tender, mobile, firm, and dull on percussion. No ascites was evident. Rest of clinical examination was unremarkable. Blood chemistry parameters were within normal limits. Blood cell count was indicative of mild anemia (hemoglobin = 11.2 g/dL). Serum tumor markers beta-HCG, CA19-9, CA-125, CEA were within normal range. Chest and abdominal X-ray showed no significant finding. Ultrasound evaluation demonstrated a solid heterogeneous lobulated hypoechoic mass in soft tissue of the left pelvic cavity with lobulated margin without calcification suggestive of a tumoral lesion. No other relevant finding was observed. In double contrast abdominopelvic CT scan, a well-defined mass with lobulated margins measuring about 60 × 45 × 40 mm at left lower quadrant of the abdomen anterior to left psoas muscle was seen. After contrast injection, tumoral mass was enhanced mildly. Figure 1 shows a coronal view of mass after injection of contrast. Magnetic Resonance Imaging showed a lobulated mass at lower lateral quadrant of the abdomen, adjacent to left psoas muscle which showed intermediate signal intensity on both T1 and T2W1 with few small cystic components. On exploratory laparatomy, a solitary large retroperitoneal multiloculated mass with hemorrhagic fluid was excised. The tumor was composed of an encapsulated 10 × 7 × 4 centimeter mass with gray rubbery surface. Hematoxylin and eosin staining showed tightly packed fusiform cells with small pleomorphic vesicular nuclei and indistinct cytoplasmic borders arranged in fascicles and around vasculature with stag-horn pattern. The nuclear to cytoplasmic ratio was evidently increased (Figure 2). In addition, scattered mitotic figures, as well as areas of focal hemorrhage and necrosis were identified which were suggestive of malignant hemangiopericytoma. Further evaluation by immunohistochemistry revealed that tumoral cells were positive for desmin, CD34, smooth muscular antigen, and negative for cytokeratin, vimentin, and CD31, confirming the diagnosis (Figure 3). Five days following surgical excision, the patient was discharged with an uneventful hospital stay and without receiving chemo- or radiotherapy. The patient is under follow up with regular CT scans and after one year, is currently well without any evidence of recurrence or metastasis. Hemangiopericytoma was first described by Stout and Murray in 1942 (6). According to the literature, HPC has an equal gender distribution and has been reported in four to 72 years of age, usually affecting individuals in fourth or fifth decade of life with a median age of 45 years at the time of diagnosis (4). Therefore, according to our knowledge we are reporting the oldest case. Clinical presentation of retroperitoneal HPC is non-specific and currently no pathognomonic symptom or sign has been ascribed to it. HPCs usually present as painless lumps with varying sizes of 1 to 20 centimeters and gradually enlarge and cause pressure effect on organs nearby. Pain or tenderness usually occurs in the late stage of the disease (7). Paraneoplastic syndromes were reported in some cases of HPC and include hypoglycemia which is resolved upon resection (8), hypertension, and gynecomastia due to production of tumor insulin-like growth factor I and II, and rennin (9, 10). Plain radiography usually shows well distinguishable soft tissue mass, rarely with calcification or osseous changes in less than 1% of tumors (2). However, plain radiography features are not specific and it is not possible to diagnose HPC solely by plain radiographic findings. In case intestinal invasion is suspected, barium studies may be helpful (5). Ultrasound findings are varied, however well-defined cystic masses, with or without calcification may be detected. Ultrasound assessment can also provide some information about the borders of the mass and its internal components. Color Doppler evaluation can illustrate intra-tumoral arteriovenous connections and is a proper tool for guidance in preoperative biopsy in some cases (11). CT scan has a very important role in the diagnosis of HPCs. These tumors usually present as large and well encapsulated masses in abdominal, pelvic or retroperitoneal space which displaces parts of gastrointestinal tract or great blood vessels (7). Application of intravenous contrast increases the accuracy of CT scan in diagnosis of HPCs, since hypervascularity of HPCs lead to prominent enhancement of these tumors, particularly in their peripheries (pseudocapsule) (12). Other features of HPC in CT scan include well-demarcation, lobulation, septation, large size, multiple areas of low attenuation due to necrosis, hemorrhage, or cystic degeneration of the tumor, and occasionally speckled calcifications (5, 12). Furthermore, CT scan is the most suitable method for assessment of size and relationship of the HPC with adjacent organs. Other soft tissue tumors including liposarcoma, malignant fibrous histiocytoma, and leiomyosarcoma which are more common mesenchymal masses in retroperitoneum, are considered in differential diagnosis of HPC (13). Although liposarcomas may present similar features in CT scan, they are usually not well enhanced by intravenous contrast since they lack condensed vascularity. Furthermore, CT number indicative of fat tissue may help in differentiation of these tumors in some cases. Angiography shows hypervascular nature of the mass and might also be helpful in embolization of the tumor prior to surgical removal (14, 15). Pathologic assessment remains the single means of definite diagnosis of HPC. Macroscopically, the tumor is soft and rubbery. Microscopically, HPC is characterized by large numbers of thin-walled branched sinusoidal vessels surrounded by and enclosed within nests of spindle-shaped cells (stag-horn configuration). Occasionally, cells show ovoid or even round shapes (4). Silver connective tissue stain can properly show extraluminal cells outside the endothelial basement membrane which avoid union with hemangioendothelium (16). 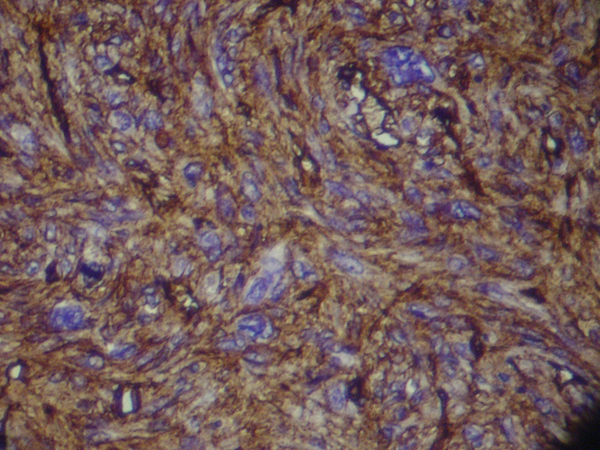 Immunohistochemical staining is indicative of cells positive for CD34, vimentin, and smooth muscular antigen and negative for S-100, CD31 (ruling out vascular nature of the tumor), cytokeratin (ruling out synovial sarcoma), actin, neuron specific enolase, carcinoembryonic antigen, laminin, and desmin and is useful in confirming the diagnosis (17). No reliable pathologic grading system is established for determining the potential for malignancy. 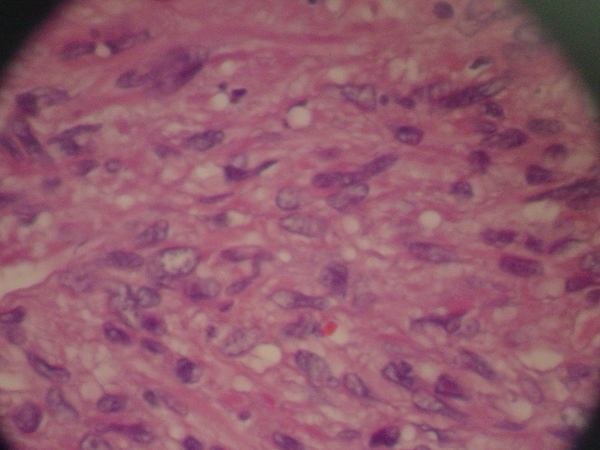 However, prominent mitoses (greater than four mitotic figures per high power field), necrosis, hemorrhage, and increased cellularity are suggestive of malignant nature (4, 18). Clinically, local recurrence or distant metastasis is definitive of malignant behavior. Notably, HPCs of the peritoneum and retroperitoneum tend to be more frequently malignant (7). In our case, hemorrhage and necrosis were present, suggesting malignant behavior of the tumor. Wide surgical resection is the treatment of choice of HPC (2, 19). Albeit hazardous, pre-operative vascular embolization, has been reported to be effective in reducing intraoperative blood loss (14, 15). Rapid resection is also beneficial in decreasing the amount of blood loss during operation. Although HPC is sensitive to radiotherapy, complete remission with radiotherapy alone is rare and it is applied as adjuvant therapy following incomplete surgical resection (20, 21). Similarly, chemotherapy is considered in adjuvant therapy of unresectable and metastatic cases (22). In general, prognosis of the HPC remains poor with five years survival rate of less than 50% (4, 23). In malignant cases, ten-years survival rate decreases to 29% (19). Local recurrence or metastasis can come about even decades later (24). Distant metastasis may occur via hematogenous and to a lesser extent via lymphatic route, predominantly in lung, bone, and liver (5, 13). Despite its rare incidence in comparison with other mesenchymal tumors of retroperitoneal space, hemangiopericytoma should be considered in the differential diagnosis of well-defined lobulated retroperitoneal masses. We thank Dr. Hamidreza Mansouri for his kind support. Implication for health policy/practice/research/medical education: In this paper, a 73 years old woman with retroperitoneal hemangiopericytoma is reported and literature is briefly reviewed. Authors’ Contribution: Dr. Seyed Hossein Yahyazadeh was involved in diagnosis and treatment of the case and revised the manuscript. Similarly, Dr. Mehdi Mousavi was involved in diagnosis and treatment of the patient, as well as revising the first draft of the manuscript. Dr. Saadat Molanayi was involved in pathological diagnosis and critically revised the manuscript. Dr. Bahram Salmanian was involved in diagnosis of the case and drafted the manuscript. Dr. Amin Mohamadi. was involved in diagnosis of the case and drafted the manuscript. Financial Disclosure: There is no financial interest to disclose for this report. Funding/Support: No funding is sought for presentation of this case.